For this budget price set Warner Classics have dug into their back catalogue for these early 1990s Teldec recordings. Salzburg-born violin virtuoso Thomas Zehetmair won prestigious awards in 1997 for his 1995 Birmingham recording of the Szymanowski Violin Concertos with the CBSO under Sir Simon Rattle on EMI Classics 5577772. Great acclaim was accorded to Zehetmair’s outstanding 2001 Propstei St. Gerold recording of the Eugène Ysaÿe Sonatas for Solo Violin on ECM 1835. In addition, as the leader and founder of the Zehetmair Quartet there have been more awards for Zehetmair for his 2001 Zurich recording of the Schumann String Quartets 1 and 3 on ECM 1793. For many years it was generally thought that Mozart had composed his series of five Violin Concertos in Salzburg in 1775. It is not certain if the set was intended for his own use or for Salzburg court violinist Antonio Brunetti, who Mozart later judged as coarse, vulgar and a disgrace to his profession. They were also played in Salzburg by Johann Anton Kolb, for whom Leopold Mozart implies one of the concertos had been written. It is said that the first of the five, the B flat major, K207 was written in the spring of 1773 in Salzburg, not 1775, as originally thought. It is scored for an orchestra with pairs of oboes and horns, in addition to the usual strings. Mozart completed his D major Concerto, K211 in June 1775, scoring it for the usual orchestra of oboes, horns and strings. The Concerto in G Major, K216 shares the greater popularity of the last three of the series. The Adagio, in the view of Albert Einstein, “could have fallen straight from heaven.” The opening orchestral theme in the final movement is from a popular folk tune known in Mozart’s day as ‘The Strassburger’ which gave the work its occasionally used nickname, the Strassburg. The D major Concerto, K218 together with the A major Concerto, K219 are grander in scale than their three predecessors. In K218 the final movement Rondo contains both a gigue and a gavotte. The Concerto in A major, K219 contains a final movement Rondo with a striking section that gives the work the title Turkish. Included in this set is the contentious sixth Violin Concerto in the key of D major bearing the Köchel catalogue number K271a. This is a rarely heard Mozart work of doubtful authenticity and one that remains the topic of much discussion. I have seen separate dates of 1775 and 1777 attributed to the D major score. Among the various explanations put forward is that it was possibly sketched out by Mozart and completed by Sauzay or Baillot or that it could be a copy by Mozart of another composer’s concerto. The controversial score, infused with pizzicato effects for the soloist and orchestra in the Andante, does come across as different in character to the Violin Concertos 1-5; feeling weightier with a highly distinctive style. Austrian Thomas Zehetmair recorded this series as soloist and director of the Philharmonia in 1990 and 1991 at Aldeburgh. As an exceptional Mozart interpreter he provides a compelling blend of artistry and elegance in performances that are admirable in all respects. The interpretations with their endearing understated quality are distinguished by a most agreeable blend of timbre, impeccable ensemble and clean and highly polished articulation. I was especially impressed by Zehetmair’s unforced selection of tempi and the amount of charm and poetry in evidence. Of the many highlights the Strassburg, K216 is the most impressive. Zehetmair in the melodious opening movement is jaunty and spirited and the Adagio, one of Mozart’s most appealing and songful slow movements, is ravishingly performed with a restrained beauty. The K219 Turkish has an especially delightful Rondo finale which is played with considerable freshness and immense verve. I especially enjoyed the searching and dreamy quality of Zehetmair’s reading of the tender Andante of the D major, K271. The warm Snape Maltings sound on the set is realistic and well balanced only serving to enhance Zehetmair’s interpretations. The rather concise booklet notes from Apex left me wanting more detailed information about the scores. There are a large number of recordings of Mozart’s concertos in the catalogues. I have provided, as a rough guide only, a list of the more established sets that are likely to be encountered: Arthur Grumiaux with the LSO under Sir Colin Davis on Philips, Itzhak Perlman with the Berlin Philharmonic on EMI, Takako Nishizaki with the Capella Istropolitana under Stephen Gunzenhauser on Naxos, Anne-Sophie Mutter with the BPO under Karajan on Deutsche Grammophon, Anne-Sophie Mutter with the LPO on Deutsche Grammophon, Monica Huggett and the Orchestra of the Age of Enlightenment on Virgin Classics, Simon Standage and the AAM under Christopher Hogwood on L’Oiseau-Lyre, Henryk Szeryng with the ASMF under Neville Marriner on Philips, Itzhak Perlman with the Vienna Philharmonic Orchestra under James Levine on Deutsche Grammophon, Pamela Frank with the Zurich Tonhalle under David Zinman on Arte Nova, Cho-Liang Lin with the ECO under Raymond Leppard on Sony and Yehudi Menuhin with the Bath Festival Orchestra on EMI Seraphim. a) Julia Fischer with the Netherlands Chamber Orchestra under Yakov Kreizberg on PentaTone Classics PTC 5186 064 (K216; K218; Adagio K.261; Rondo K269) and PTC 5186 094 (K207; K211; K219). b) Maxim Vengerov returning from his sabbatical to record K211; K214 and the Sinfonia concertante, K364 (with violist, Lawrence Power) on EMI Classics 378374-2. Performing and directing the UBS Verbier Festival Chamber Orchestra this is the first volume of Vengerov’s project to record all of Mozart’s Violin Concertos in two years. For those wanting just one disc of Mozart’s Violin Concertos the field is dominated by two straight choices; both on period-instruments. Firstly, the authoritative and highly stylish accounts from Viktoria Mullova on Philips and the exciting and astonishing risk-taking performances from Fabio Biondi on Virgin Classics (see review). Viktoria Mullova performs and directs her wonderful interpretations of Mozart’s Violin Concertos Nos. 1, 3 and 4 with the Orchestra of the Age of Enlightenment on Philips 470 292-2. Recorded in 2001 in London, Mullova’s exciting, stylish and characterful interpretations left a huge impression on me. Playing a ‘Jules Falk’ Stradivarius (1723) with gut strings and using a period bow, Mullova’s playing is remarkable, even hair-raising. With exhilarating, explosive and thought-provoking performances of concertos 1, 2 and 3, Fabio Biondi performs and directs Europa Galante, recorded in 2005 in San Marcello, Italy on Virgin Classics 3447062. Europa Galante are one of the very finest and most exciting ensembles that have come to cutting edge prominence in the authentic-instrument scene in the last ten years. Not providing performances for the traditionalist, Biondi offers most individual interpretations playing with a strong sense of expressive freedom. He imaginatively and bravely chooses to provide exciting and energetic playing with an occasional biting attack; a risky approach that comes off with sheer perfection. He never loses his innate style and artistry. His strongly dramatic and colourful playing comes across with the spontaneity of a live performance, rather than madcap recklessness. For the listener who prefers modern instrument performances the set to choose is unequivocally that from Arthur Grumiaux and the London Symphony Orchestra under Sir Colin Davis on Philips 438 323-2 (c/w Adagio and Rondo for violin and orchestra, K261, K373; Sinfonia Concertante for violin, viola and orchestra, K364). These evergreen Grumiaux performances are wonderfully satisfying, being especially beautifully played and graced with an abundance of vivacity and expression, together with an appealing purity of tone. Grumiaux made the recordings in London between 1961 and 1964. The forty year old sound quality, in these digital transfers, stands up remarkably well. 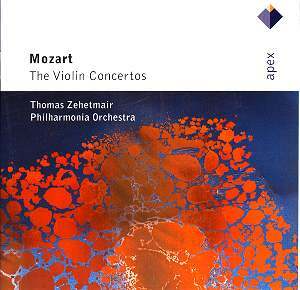 Thomas Zehetmair and the Philharmonia demonstrate an impressive affinity for these Mozart Violin Concertos but the competition in the catalogues is extremely fierce.